Ideal for industrial work areas! Demag's most cost competitive hoist. 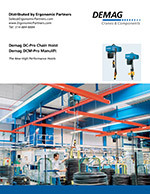 The DC chain hoist has the standard features you need, for safe operation you can trust. These small electric hoists are perfect for installation on a workstation crane system, or jib crane. 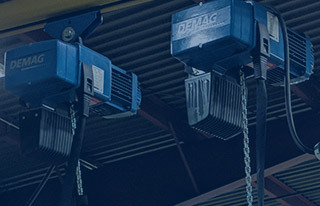 These Demag hoists are built to be easily moved around by your operators. Demag's product philosophy is based on a proven, modular system approach. Modular components, which are compatible with one another; are combined in various ways to meet individual requirements and to form material handling equipment and machinery that function at the highest levels of efficiency. Components are manufactured to high quality standards using the latest techniques and processes, including continuous tests and checks throughout the manufacturing process. This ensures each system meets or exceeds national regulations or standards. Hoist Capacity: 275 pounds to 4,400 pounds. Hoist Speeds: up to 32 fpm on 275 pound units, up to 16 fpm on remainder of hoists. -DC-Pro has speeds up to 100 fpm. 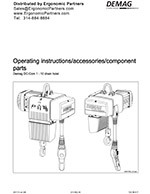 Hoist Suspensions: top hook, push trolley, and motorized trolley. 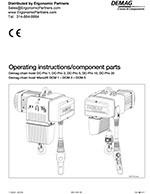 Hoist Limit Switches: Upper and Lower limit switches. Hoist Overload: Slip clutch to prevent damaging overloads of your hoist unit. Hoist Rating: H-4 hoist rating, up to 360 starts per hour. All small electric hoists are 2-speed as standard, 4:1 speed ratio. Motorized Trolley Speed: Motorized trolleys available with standard 2-speed of 80/20 fpm. High safety factor for load chain, 5 or 6 pocket wheel sprocket, Gearbox lubricated for 10 years. Plug in electrical connections, State of the art controls, Long life low amp switching. Easily adjustable pendant height, Pendant or available with remote control, 24 volt pendant control voltage. 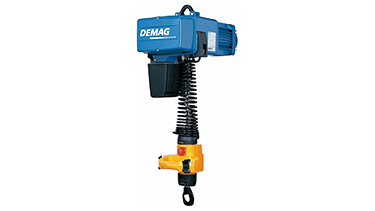 In addition to the standard pendant, Demag offers the Manulift ergonomic handle (DC Pro models only). Cycle and load spectrum monitoring, Diagnostic service data, Integrated 3 axis motion controls (DC Pro models only). All hoists up to 1-ton are single reeved, double reeved for 2-ton. CSA approved, IP55 rated enclosure suitable for outdoor environment. All electrical controls are located in one panel and all mechanical components are located in another for ease of maintenance. 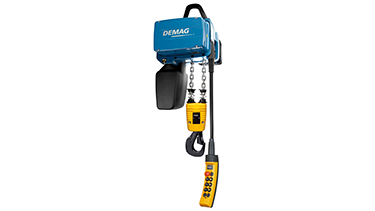 Demag hoists are designed for long life and backed with a long 2 year "no catch" warranty. Hoist manufacturer's warranty does not include on-site repairs. Customer will need to send the hoist, with freight pre-paid to EP's repair facility. 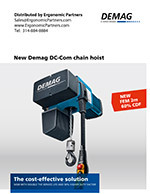 Let your Ergonomic Partners sales representative assist you to pick the correct Demag hoist for your application. Please contact Ergonomic Partners today. Ergonomic Partners serves clients from coast to coast, Canada, Mexico and especially focused in the states of Missouri, Illinois, Indiana, Kansas, Arkansas, Mississippi, Nebraska, Tennessee, Kentucky, Iowa, and Oklahoma.